Updating a firmly established ruleset can be fraught with difficulties. At the club many of us have pretty much abandoned X-Wing, Kings of War and Bolt Action after they jumped to v.2. It's difficult because often a group of people will invest in the same game, but when the game has a major version change not everybody may be prepared to upgrade. So there can be quite a bit of fragmentation amongst the available players. 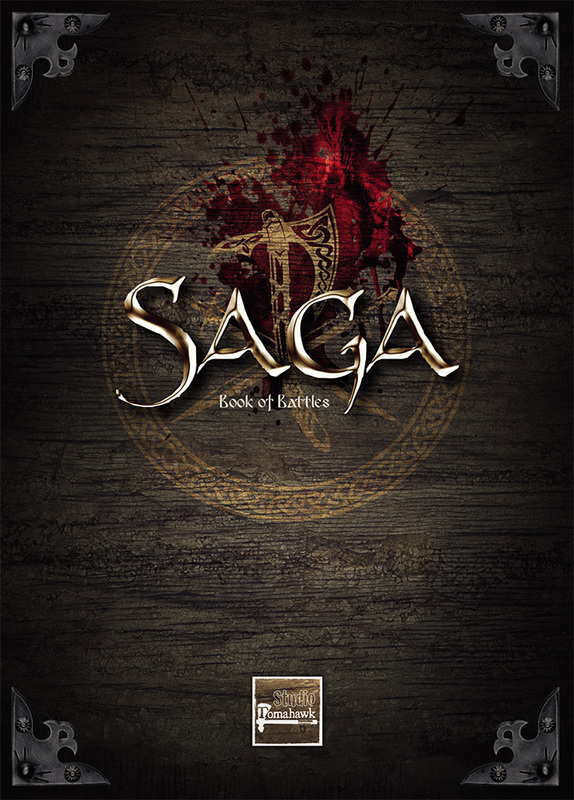 Studio Tomahawk's SAGA v.1 was a game that was very widely adopted at the club. Almost everybody had it and the game was a firm favourite being played on a very regular basis. And then came v.2. A few of us upgraded quickly, but a few folks didn't see the need. Fragmentation. Personally I believe the v.2 rules do improve on the original ruleset and help to iron out some of the inconsistencies that can affect any game. I've bought the new Viking supplement and have the upgrade pack for Aetius and Arthur (now called Age of Invasions). I won't be re-buying Crescent and Cross (Age of Crusades) though. One of the big selling points of SAGA v.2 was the promise of different Universes. The existing supplements represent three such Universes. Games are intended to be played within a Universe. It is possible to play between Universes (e.g. 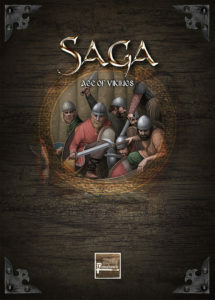 Vikings against Picts), but Studio Tomahawk has warned that such games may not be balanced and there may be unexpected interactions between abilities and battle boards. The fact that different Universes are contained in their own books also means that there can be a single rulebook for the whole game that won't become out of date as new Universes are published. Studio Tomahawk has also released a scenario book (Book of Battles) that provides a range of generic scenarios that can be played across different Universes. 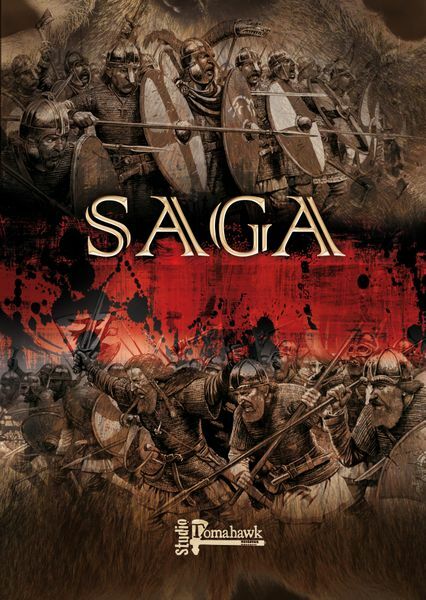 Both the SAGA rulebook and Book of Battles are paperback and relatively inexpensive. Universe books are hardback and cost quite a bit more (AoM is approx. £30 at the time of writing). 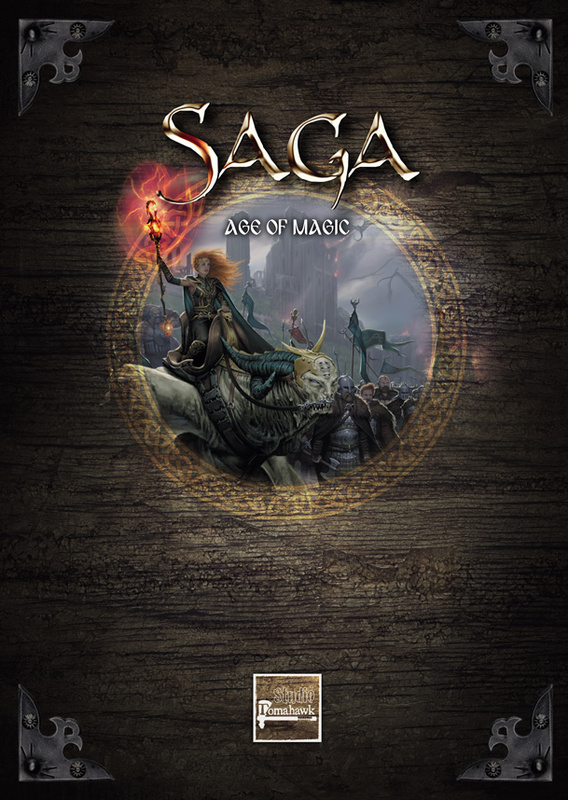 Age of Magic (AoM) is a new Universe for SAGA v.2. The book isn't yet widely available but can be pre-ordered at Gripping Beast. I was lucky to collect mine at Salute on Saturday. Each Universe book follows a similar design and they are all very nicely illustrated throughout with high quality photos of various figures and terrain. The AoM is a little different in that it introduces some significant changes to the basic rules and these will require a little explanation. 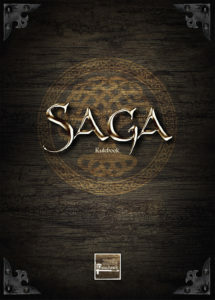 The basic premise of AoM is to allow SAGA to be used in a Fantasy setting. To be honest some battle board abilities in the more historical Universes can already be somewhat fantastical, but that's a discussion for another day! Of course, fantasy SAGA probably means that we will also see SciFi SAGA at some point as well. Who knows, we may also get a Pulp SAGA. But rather than limit players to specific traditional fantasy factions (e.g. dwarves or elves), AoM has generic factions that can be used to suit the warband that you wish to field. There are six different factions: The Great Kingdoms, The Lords of the Wild, The Undead Legions, The Horde, The Otherworld and The Masters of the Undereath. If you wish to play a warband that is composed of vampires and skeletons, then The Undead Legions is an obvious faction to use. But what about say dwarves. Well, you could decide to base these around The Great Kingdoms where their cultural and technological abilities may be the main flavour of the faction. Or you could choose The Masters of the Underearth with abilities that focus on a life lived underground. Really, the choice is yours and this makes the AoM very appealing. It's also worth stating that Studio Tomahawk encourage the use of any figures that you have in your collection. There will not be an 'official' range that you need to stick to in order for your warband to be 'legal' with respect to the rules. Companies will no doubt start releasing figures for AoM, indeed Gripping Beast have already released undead miniatures for The Undead Legions, but you don't have to use them. I'm sure I'll end up buying new figures, but I have a mountain of zombies and skeletons from my days playing Warhammer and I've already started putting together a standard eight point warband. Eight points? Well, the new rules introduce new troop types and magic. Both of which require points to be spent, so a slight increase in the basic six point game is needed. As well as the now familiar hearthguard, warriors and levy; AoM introduces Sorcerers, Lieutenants, Creatures, Monsters and War Machines. Lieutenants are hero characters (similar to the warlord) that have their own characteristics and also a faction specific special rule. For example in The Undead Legions, the lieutenant is a Black Knight that can take a fatigue instead of another hero. So if the warlord used resilience to cancel a wound, the fatigue could instead be put on the Black Knight. Lieutenants are not purchased using points. Instead they are 'purchased' by discarding either 1 Creature, 2 Hearthguard, 4 Warriors or 6 Levy. Lieutenants may also be mounted. Details are provided in a handy table that is specific to each Faction. Creatures represent figures that are generally larger and more imposing than a normal human, but still able to follow orders. This latter point is important as we shall see later. It basically means that they can take advantage of advanced Saga abilities on the battle board. Creatures are formed into units of 2 to 6 figures and can be either Bipeds, Quadrupeds or Flyers. Seasoned SAGA players will remember that a point buys either 4 hearthguard, 8 warriors or 12 levy. In AoM a point can also buy 2 creatures. So each Creature is effectively worth half a point. But there's more. An extra creature can also be purchased by discarding half a point's worth of other figures: either 2 hearthguard, 4 warriors or 6 levy. But there is an important restriction here that is tucked away in a box on page 15 of the book. "it is forbidden to recruit a unit by removing a mix of several troop types"
This is an important rule to remember. If you want four Creatures in a single unit, you can only acquire them by (1) spending points, (2) discarding figures of the same type or (3) a combination of (1) and (2). In SAGA v.2, standard troops have an exhaustion limit of three. So once a unit takes three fatigues, they must rest before the unit can be activated to Move, Shoot or Charge. But in AoM some units such as Creatures have a new rule called Imposing. This increases their exhaustion level from 3 to 4. What would a fantasy game be without Monsters?! Well, in AoM there are three different types of Monster available: Behemoths (most aggressive), Titans (slow but better armoured) and Scourges (flyers). Each Monster forms a single unit and can be recruited by a warband for just 1 point! But not all factions are equal and the number of Monsters that can be recruited will depend on the faction that you choose to play. So Monsters are big and tough. Behemoths have an Aggression rating of 14 (! ), whilst Titans have a Resilience of 2 (meaning 2 wounds can be ignored for each fatigue taken). Like Creatures, Monsters are also Imposing meaning that they only become exhausted once they have taken four fatigues. But, Monsters also have a new rule called Primitive. This means that they do not obey orders as well as other troop types. In game terms, a unit that is Primitive cannot use any of the advanced Saga abilities that can otherwise be used to activate a unit or enhance their melee or shooting. Monsters are tough, but they aren't overpowered and with a bit of thought, they can be overcome. War Machines have previously made an appearance in other Universes (e.g. Age of Invasions), but in AoM there are now three different types to choose from: Static (e.g. stone thrower), Mobile (e.g. chariot) or Flying (e.g. a dwarf gyro-copter). Not all factions can recruit a War Machine and even those that do don't spend any points. At least not directly. In a similar way to Creatures, War Machines can be purchased by discarding other figures. But this time only 4 warriors or 6 levy may be discarded. As far as I can tell, this is the only way that a War Machine may be purchased. The new troop types and different ways of purchasing them means that building an AoM war band will initially take a bit more effort than SAGA players are perhaps used to. The final new troop is the Sorcerer. Sorcerers cost 1 point and are organised like heroes as a unit consisting of a single figure. Some Sorcerers can be mounted. But perhaps most importantly, Sorccerers can use Magic. Studio Tomahawk has clearly put a lot of thought into the use of Magic in SAGA. There are six different realms of magic, each of which includes six different spells. Spells are fully described in The Grimoire found towards the back of the AoM book. Sorcerers from each Faction have access to two specific realms, but can only choose a maximum of three spells. Some Factions can recruit more than one Sorcerer, but if they do the same spell cannot be taken by different Sorcerers within the same warband. Magic is handled in a way that fits in with the general feel of SAGA and introduces new dice. Like standard SAGA Dice, Magic Dice have symbols that represent common (1-3), uncommon (4-5) and rare (6). Each warband has a Magic Pool that determines the number of Magic Dice that are generated each turn. But unlike standard SAGA Dice, Magic Dice are not rolled at the start of the turn. Instead, they are rolled when-ever a Sorcerer wishes to cast a spell. Casting a spell is not an Activation, so a standard SAGA Dice isn't required to activate the Sorcerer that wishes to cast a spell. To cast a spell, the Sorcerer rolls up to four of the available Magic Dice and consults the chosen spell. Each spell has three effects that increase in power. These are defined as Minimum, Optimum and Maximum. The most powerful effects being more difficult to achieve. For example, some effects require only a single Magic Dice with a blank symbol (meaning any die will suffice), whilst the most powerful effects may require a rare or even a rare and uncommon. Why isn't the most powerful effect called Optimum? After all, players will want to cause as much carnage as possible. But casting spells may have unexpected results. A Sorcerer that uses the Maximum power of a spell risks abusing his power and disappearing in a thundering detonation! A Sorcerer that does use the Maximum effect must roll 2d6 on the Abuse of Power Table. High or low scores will end badly... A player can choose how to spend their Magic Dice to avoid this unfortunate side-effect. In other words they can play it safe and select the Minimum effect, even if the Magic Dice could be used for the Maximum Effect. Like other Universe books, AoM provides an overview of each faction. This details the troop types that are available, general rules for the faction (such as number of War Machines available etc) and Special Rules. One important Special Rule affects levy in The Undead Legions. With this faction levy are called Mindless and cost 1 point for 20 figures. The minimum size for a unit is 12 and the maximum is 24. However, unlike the levy in other Factions, undead Mindless can't be discarded to obtain other troops. Note that this latter rule is missing from the rulebook, but will be corrected in the FAQ. All factions have a new terrain type available to them: Sacred Ground. This terrain is a small, high and impassable area that has special rules depending on the faction. 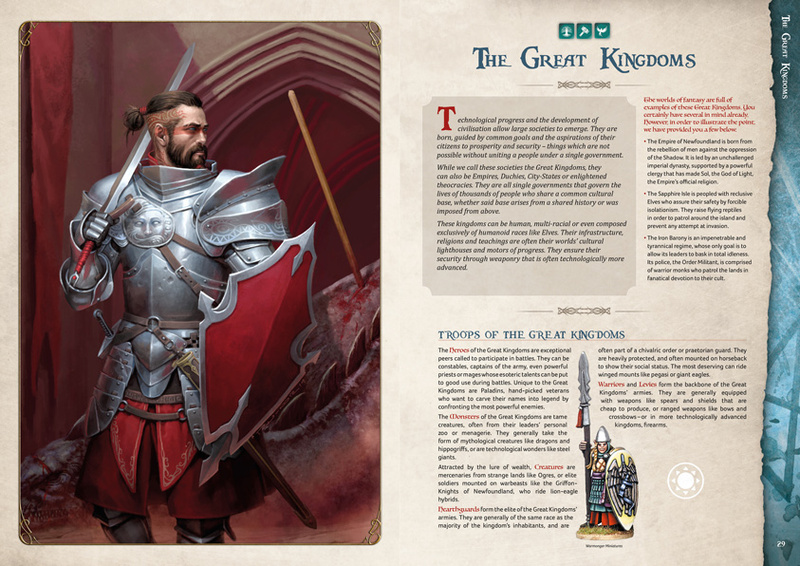 For example, The Great Kingdoms Faction has a Memorial that allows the warband to re-roll (for free) a SAGA die during the Orders Phase - so long as a unit of eight or more figures is within VS and there are no enemy units within S.
Each faction also has Legendary Units and Legendary Warbands. Legendary Units are a little like the more familiar Mercenaries. They cost a certain number of points (or require upgrade/downgrade of another unit) and have special rules associated with them. For example, The Lords of the Wild can recruit four Shapeshifters for 1 point. as a Warlord - Gulp! By discarding a Magic Die, the Monster Warlord can select other Monster units within L to temporarily remove the Primitive special rule. Nasty. I would definitely like to see more Legendary Units and Legendary Warbands being developed. They can add new ways to play without publishing whole new factions. Finally, there is a new Quick Reference sheet that summarises most of the new rules introduced in AoM. This doesn't replace the standard QR sheet, but will be very useful in games. There are no new scenarios in AoM. Since we have the Book of Battles this isn't really unexpected, but some fantasy scenarios that make the most of the setting would have been fun. There are also no War Banners or Relics & Artifacts. Both are included in the Vikings Universe and would have been great additions to AoM. Perhaps they proved too difficult to balance. So there we have it. AoM looks like a great addition to SAGA and will I'm sure encourage more folks to finally make the jump to SAGA v.2. Very much looking forwards to getting my first game in! A couple of observations though. Getting in was pretty painless with the online tickets. We arrived just after ten and there were no queues. Lighting is normally awful at Salute, but this year it was perhaps a tad better than last? I still needed my glasses for things that I should be able to see well in normal light though, so it still wasn't ideal. Less people than I remember in previous years? Fewer really large games (although the Boudicca games looked pretty good). I spent most of the day carefully scrutinising the various traders for bits and bobs that I didn't know I needed till I spotted them (hem)! All said and done, we had a great time at the show and look forward to going next year. Anyways, here's the loot shot. There we have it. Oh, one last thing. When I got home I found a golden ticket in my Salute bag! Since we were collecting lots of pre-orders, we rushed around to grab stuff so it could be safely stashed back in the car. Unfortunately this meant I didn't find the golden ticket till I got home... Happily the guys at Salute have said I can still claim the prize - Fifty big ones! 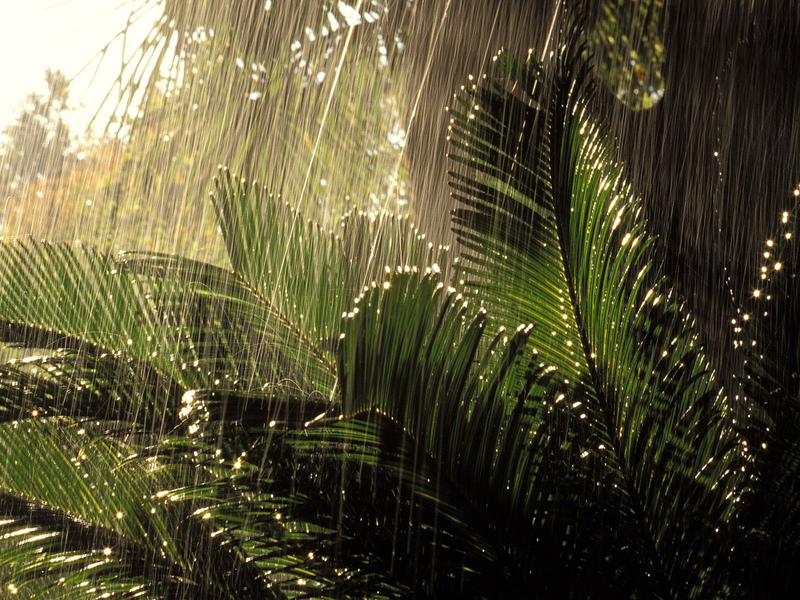 "The region through which we are now advancing is thickly forested and heavy downpours are frequent. My guides have told me that this jungle is home to numerous unique species of birds, monkeys and plants... One of the guides reported back to me this morning, saying that he had discovered, scattered throughout the forest, elements of stone statues..."
Mary's column is marching through the forest when they come across numerous stone ruins that are being reclaimed by the surrounding jungle. But across from her, through the trees and heading towards the same treasure is the witchdoctor Ujuwa and his column of fierce warriors. Whilst travelling upriver on the Bel Azur, various mishaps have befallen Mary's column. Exhausted, her soldiers find themselves unable to push on and are forced to stop and catch their breath. Exhaustion also takes its toll on Mary's Trained Askaris and one man succumbs to jungle fever. The famed botanist Bergamote, is still rather tender after his recent encounter with a hippopotamous. But at least he is now back on his feet after a brew made from medicinal plants. The Trained Askari push on and step carefully into the overgrown ruins hoping to find a section of stone statue. Ujuwa has the same idea and his Pygmy Warriors rush to the same destination! The pygmies hurl their spears and charge! 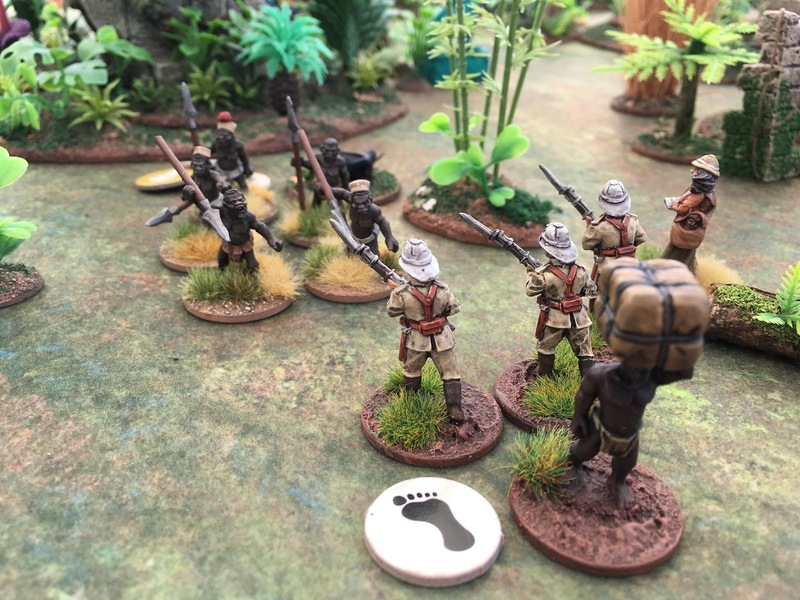 The Askari are caught unawares and some fall whilst the remainder scramble backwards. But the pygmies pursue them and whilst Mary and her Soldiers look on helplessly, the group are slaughtered. Bergamote's pith helmet saves him as a spear glances off his head, but he falls under a jungle bush, unconscious. Led by Mary's Kirangozi, the Ruga Ruga rush forwards in the hope of finding forgotten treasure. But as they scramble through a particularly dense thicket, the group are set upon by a leopard! The Ruga Ruga are drunk on the thought of loot and the leopard is quickly dispatched. The pelt will fetch a good price once they are back in the port. They push on and find strange carvings. More ruins lie ahead and the Ruga Ruga scramble over tumbling walls to discover the remains of an ancient temple. Within the temple they find another section of statue. But what magic is this? The broken pieces appear weightless and can be carried by a single man. Dark forbiddings start to trouble the Ruga Ruga as they hack their way onwards through the jungle. Meanwhile, Ujuwa sends his Archers forwards whilst, accompanied by his Bundukis, Ujuwa finds another section of statue together with a stash of forgotten loot. Having found their courage, Mary's Soldiers brace themselves as the Pygmy Warriors charge towards them. A soldier is pierced by a spear and falls, but Mary scatters beads on the ground and the Pygmy assault is deflected. But the Pygmy Warriors are not fooled twice by these worthless trinkets. They now keep their distance and throw spears. Seeing that the pygmies possess part of a stone statue, Mary urges her Soldiers to charge. Another soldier drops to the ground and the Soldiers are forced back. But the Pygmy Warriors are becoming fatigued and also retire to gather their strength. 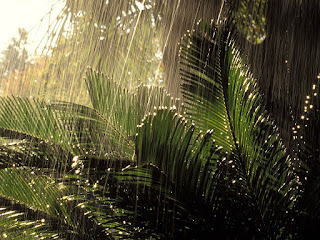 More rain starts to fall and both columns reflect on the situation. Mary's Adventurer's are a man down at the hands of the pygmies and have retreated into some thick vegetation to hold a defensive line. They are joined by Mary and the Soldiers. Mary is dejected at the thought of losing the stone statues, but she is unaware that her Kirangazi and Ruga Ruga possess two parts and have spied a third. Ujuwa has found that the jungle has not been conducive to his witchcraft. A moment earlier, one of his Bunducki disappeared in a puff of smoke as a ritual went terribly wrong. But Ujuwa remains confident. He is in possession of three sections of statue and his Warriors are pursuing the unsuspecting Ruga Ruga. Can he claim all six? The Ruga Ruga push their way through the vines to claim the last piece of statue. Disaster! This area is riddled by spiked pitfall traps dug by the local Fang tribe. Three of the Ruga Ruga disappear into the ground where they are impaled. Grabbing the last piece of statue, Mary's Kirangozi and last remaining Ruga Ruga suddenly see Ujuwa's approaching Warriors and flee for their lives. Suddenly there is a mysterious popping noise and a small plume of smoke appears where the last Ruga Ruga once stood. Mary's Kirangozi looks on in disbelief and finds himself stood alone with Ujuwa's Warriors bearing down upon him. But both groups are now fatigued. Can the Kirangozi escape? He certainly has a good go at it! Lucky those statues are light as a feather...! As he scrambles amongst the bushes, the Kirangozi's luck runs out. The light is fading and the jungle will soon be in darkness. Ujuwa is satisfied with his haul, but can he stop the foreigners for good? Ujuwa's Hunters pursue Mary and she is forced to retreat. As the Hunters close in, a thick rancid smell fills the air. The Fang Tribe have been burning rubber and a thick pall of smoke covers the jungle. Mary and what remains of her column quietly slip away into the darkness. Ujuwa secured all six pieces of statue, made two discoveries, gained 4 pieces of loot and dispatched two characters for a total of 33 vp. The Congo gods have not been kind to Mary. She did manage to kill one of Ujuwa's sacred warriors and made two discoveries, but she only scored 13 vp. With his two intact statues, Ujuwa gains two domains of knowledge. Although the nearby river is tempting, he decides to travel through thriving jungle where a hermit leads him to a plant that can be used to cure sickness. He gains another 3 medicinal plants. Ujuwa has successfully made 11 Rituals (down 1 from the last game). After the Kirangozi and botanist finally make it to camp, Mary chooses to travel over swift water. This time, all is well. Mary has now spent 15 months on expedition. Mary still has one domain of knowledge, but Ujuwa now has 2 and he will gain a level in the next adventure. 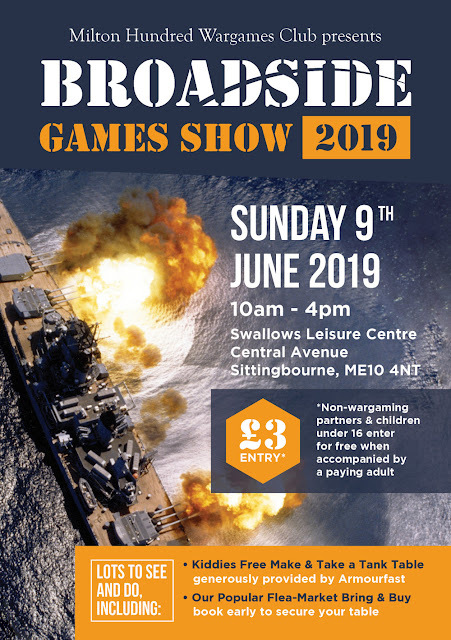 Just a quick entry to announce that my Congo inspired Dino Safari participation game will be running at this year's Broadside Games Show. Still quite a bit of work to do on the game, but it's all coming along nicely. 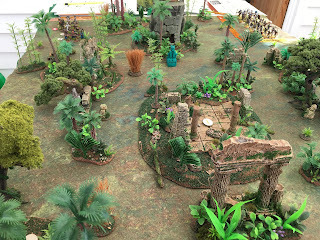 The aim is to have a fast and fun game that pits various pulp themed adventurers against a volcanic island that is inhabited by dinosaurs. The main rules are more or less finished. Various cards and other bits and pieces need to be printed, but everything is in hand. Even the terrain is mostly done. Figure painting is next on the list, but some groups are already completed. I'll reveal the finished terrain piece in a future post. Don't worry though, there's a Congo game planned for Saturday when we will continue with our Throne of Thunder campaign.